Two of the most visited historic landmarks in Landshut is the Burg Trausnitz, or Trausnitz Castle and Martinskirche, or St. Martin's Church, which are connected to each other. This view is taken from across the Isar River at dusk. Two of the popular and historic places to visit in the City of Landshut are the landmarks known as Trausnitz Castle and St. Matin's Church. This view of the castle and church was taken from across the Isar River and a fountain can be seen in the foreground as the lights come on and reflect on the monuments when dusk falls. The City of Landshut is located in the Bavarian region of Germany and is a popular city for tourists to visit. 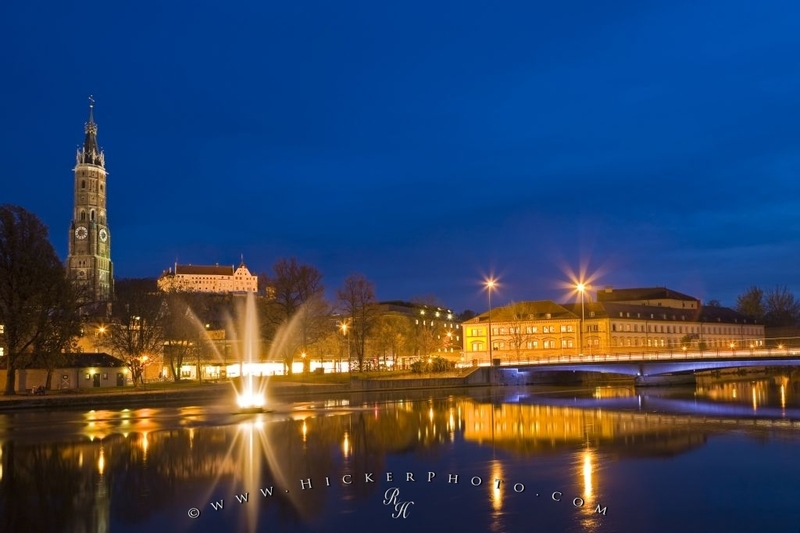 Photo of two historic landmarks in Landshut - the St Martin's Church and the Trausnitz Castle. ... In a medieval community the castle was not only the seat of the ruler, but also the heart of the city so it was not uncommon to bear the same name. St. Martin's Church, of which the Bell Tower can be seen here lit up, was built around the same time as the Castle. The Church is not the same building that was first built in 1204, it has changed over the years, but the building site is original. This version of the church was built in 1389 and was not finished until about 110 years later. I photographed this photo with the digital SLR camera model Canon EOS-1Ds Mark III, aperture of f/8.0, exposure time of 20/1 sec. on ISO 100, as always I used a original Canon Lens, the focus lenght for this picture was 24mm.